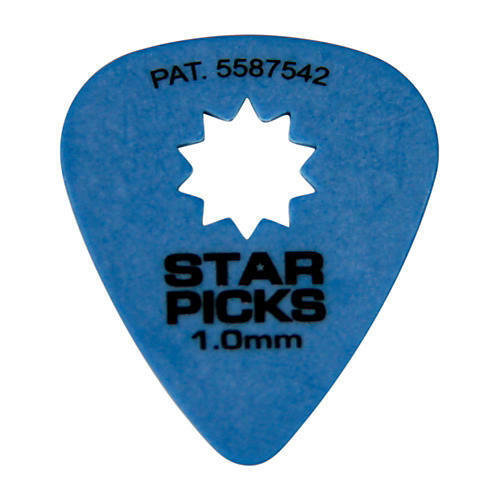 Specially designed pick with star shape cut out in the middle for a better grip. Have you ever owned a guitar pick long enough to actually wear it out? You will now. The genius of the Star Picks is in their simplicity. Everly took a standard 351 shape guitar pick, cut out a star shape in the middle, registered the patent and have been changing the lives of guitar players one pick at a time ever since. Star Picks are available in popular gauges from paper thin to hard as nails and in different colors (see options in the drop down menu). Since there are no major modifications to the standard shape, the picks feel as familiar as the old standby. Now you'll never drop your picks again. Order these intelligently designed picks today for years of playing enjoyment.